In our last blog, we began talking about residential electrical panels, how they work, why they are important for our homes, and their main parts. Electrical panels are in essence protective forts that safeguard our electrical systems, our appliances and other devices plugged into our wall sockets when there is an electrical storm, power surge, or other electrical phenomena. Main Breaker – protects the home’s electrical system and dictates the total amperage of electricity for the panel. Circuit Breakers – the on-off switches that control the ability of electricity to flow to particular circuits of the house. Neutral Bus Bars – the points of connection for the circuit’s neutral wire: the white wire brings electricity back to the panel once it is used by appliances and other devices. Grounding Bus Bars – these connect the system to the grounding bar and the grounding conductor. All of these parts make up the electrical panel that keeps our electrical systems and those things that rely on them to function safe. There are a few reasons to replace your electrical panel in your Colorado Springs home: improved functionality, update your system, and replace damaged panels. If you feel you may need more power for your home, you should consider contacting your local electrician, for just simply replacing an electrical panel on it’s own will not solve your need for more power. Often to get more power to your home, you will need to replace your electrical panel, as well as your cables and electrical meter. Reasons you may need more power for your home include remodeling and expansion, installation of new, modern appliances, use of more electronics that are powered or charged by electricity, etcetera. Often those living in older homes will find that they need to upgrade their electrical panel. As we mentioned earlier and in our last blog, part of the responsibilities of an electrical panel is to regulate amperage. In older homes, panels are made to provide for lower amperages than modern homes. Due to the increased use of electronics and appliances, those who move into older homes will need to upgrade their panels to accommodate modern appliances and the charging needs of electronic devices. Panels after years of use or due to other factors may become damaged and need replacement. Damaged panels should be replaced as soon as possible. Signs that your panel might be damaged include circuits tripping frequently, lights dimming when you use your appliances, and a need for an overt amount of extension cords to “make” more sockets. Electrical panels tend to last 25-40 years. Are you constantly having to flip your breakers? Do you feel that the power available to your home is insufficient? Are you remodeling your home? Contact the residential electricians of Front Range Electric! 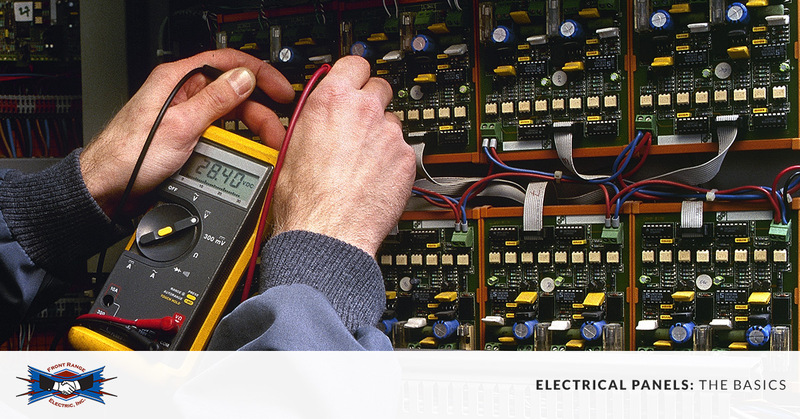 We can help you replace your electrical panels, have electrical wiring and systems up to code and more! We’d love to help you have a home that serves your family’s electrical needs, protects your appliances and other investments, and keeps your family safe. Visit our website for coupons and to schedule a free consultation with us, Colorado Springs Top Rated Local® electrician!